The other day I went to Nirvana. Not that one! The other one, the one out on Old Chao Chu Kang Road on the far side of Singapore. Nirvana Pte. 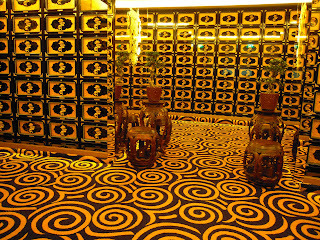 Ltd. is, according to the glossy, colorful brochure we were given on our arrival, ‘Singapore’s most luxurious 6-star grade modern columbarium with full air-conditioning’. 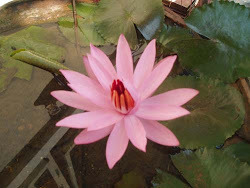 The company that runs Nirvana is ‘the pioneer and market leader in bereavement care industry in South East Asia’. And I can believe it. The place is amazing, if that’s the right word - ultra-modern buildings, manicured grounds, lavish interiors, and everything in plastic and chrome, mirrors, gaudy colors and kitsch lighting with muzak in the background. 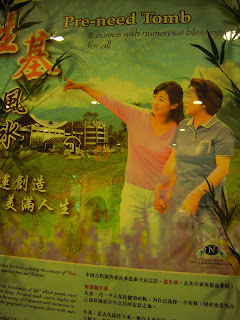 We were given a complete tour by a solicitous saleswoman who met us on our arrival. 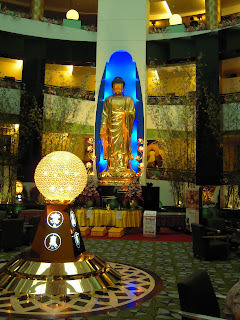 The Central Hall has a huge Buddha overlooking it and numerous comfy lounge suites positioned around it so that costumers can sit and ‘abandon their fear and sadness but instead cherish the memories and remembrance (sic).’ We checked out the huge rooms with niches where you can deposit your loved one’s ashes. And the prices are very reasonable. Approaching $100,000 for a top-end niche. The brochure informed us that buying now can be a ‘not-to-be-missed investment opportunity’ as prices are bound to go up, and that if you purchase a niche now they’ll throw in a free imported urn. Very thoughtfully, they even have a room for the ashes of non-believers. To reserve a niche in this room for a loved one or for yourself only costs $ 25,000. I was very tempted I can tell you. 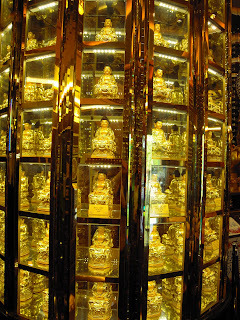 Another huge room has dozens of golden stupas in it for customers to worship. 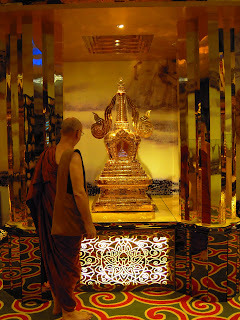 Our guide informed us that none of the stupas have relics in them yet but that they’ll be getting some soon. I didn’t ask where from but I have heard on the monk’s grapevine that there’s a factory in Bangkok now that mass-produces them to meet the demand. 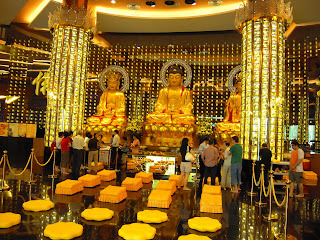 The highlight and finale of the tour was the sound-and-light show in the Great Buddha Praying Hall. The computerized color laser system and the high-tech sound coordination creates an atmosphere of, well I’m not sure. I think it’s supposed to be of heaven or Nirvana as conceived in popular Chinese Buddhism; the brochure says ‘an air of refinement and serene ambience’. 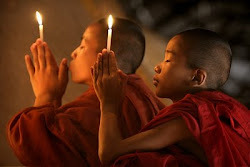 Monks are on hand to do any praying costumers might need. 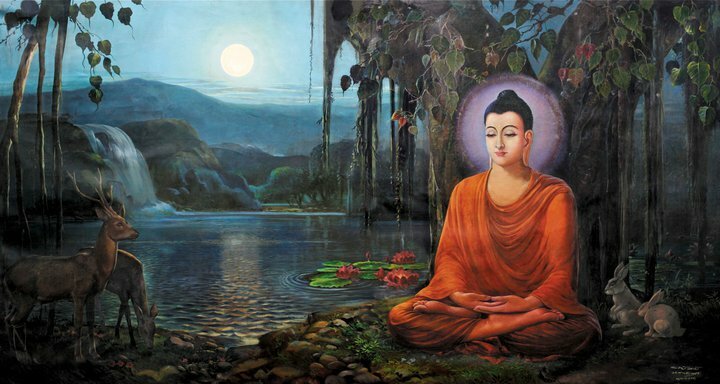 Something that attracted my attention on the way out was the pictorial display on the life of the Buddha. 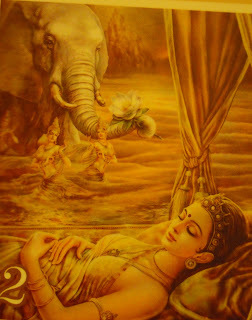 We see Maha Maya dreaming of an elephant, only in this depiction of the legend it’s an African elephant she’s dreaming of. Another interesting picture shows the Buddha walking past a mosque, in fact it looks like the entrance of grand mosque at Fatehpur Sikri. Now exactly how an African elephant could have ambled into an ancient Indian dream, or how there could have been mosques in India a thousand years before the advent of Islam, I’ll leave for my readers to figure out. But it doesn’t really matter, does it? It’s all the same! 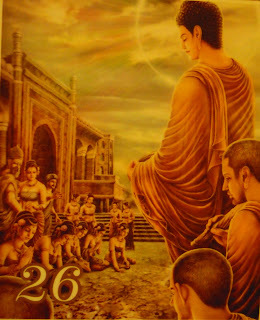 Fact and fiction, clarity and confusion, sympathy and platitudes, Dhamma and commercialism.